Business Addicts is a collaboration between Loren Bartley from Impactiv8 and Fiona Redding from The Happiness Hunter. Their podcast is for anyone that is addicted to business with the aim to helps fellow Business Addicts build a business that supports a life that they love, rather than a business that controls their life! They achieve this by providing a balance of strategies, tips and tools that will help both feed and manage your business addiction. Business Addicts podcast feeds your addiction by providing valuable content that will help improve your business and help manage your addiction by providing equally valuable content that will help you better manage your life so that your business addiction doesn’t spiral out of control! Loren Bartley is a social media consultant, educator and coach. Loren educates small businesses to be able to use the power of social media independently to grow their businesses. This is achieved by teaching businesses how to develop a social media strategy, build online communities, effectively engage with those communities and then convert them into action that aligns with overall business goals. Fiona Redding is a business strategist, motivational speaker, coach & mentor and the founder of The Happiness Hunter, in addition to co-creating The Seven Elements Life Integration program. Fiona’s super power is to get to the beating heart of your strategy, to uncover the steps required to achieve your goals and empowers you with the tools & mind-set shifts required live a life with passion, joy and meaning (whilst creating & growing a successful business – these things are not mutually exclusive). How they are addicted of both they are doing but with different ideas? How they manage their business addiction and live happy lives? What have they managed to achieve as a result of podcasting? To whom Business Addict intended for? How we better manage our lives and being passionate about what we are doing and become business addict? Why do they reckon podcasting which is so hot all of a sudden? Loren: If I was to go back and do it all again I don’t know that I would do a lot differently because of that strategy at the start. And I was very hands on, on the start because I needed to be. I needed to learn it and do that kind of stuffs. Yeah you could probably say “it would be great if I had someone to help me right from the start but I think we needed to do that.” We needed to know that, we needed to know what’s involve, and we needed to know the efficiency what we could scrap and all that kind of stuffs. I think the only thing that I could probably lack is maybe a little bit more another resource area. I still would have done a lot of the things myself to learn them first, but it just to have another person to just kind of say “Can you do this? Can you help me with this? Can you do that? Fiona: But you still needed to learn to be able to work out. The other thing that we did try. We tried to record from separate locations. It didn’t work because part of the beauty and the magic that supposed the business addicts podcast is the connection between Loren and I behind the microphone and it didn’t translate when we are in different locations. So we tried that because that would have an impact on time particularly to me travel and stuffs but it didn’t work. So that was a learning but then again that was through experience. And I think we would like anything in life, we learn through experience. In terms of how easy it is, that’s nonsense. It’s a lot of work. I think you need to make sure you do have reasonable equipment because you don’t want to have a crap quality of product. And also through those things along the way, like were uploading to libsyn and there’s a lot of things. It’s not just about the content creation and the podcast creation, it’s all sort of the technical beatsis. It’s really just knowing the tools and the processes. So that’s one off the things because that was the aspect of the technical expertise that I brought to it. I have to go often, do a bit of researching and not everyone does it the same. So you have to kind of consume all these different ways of putting a podcast to get and kind of work out what might best for you. So technically, it is challenging particularly if you just try and you don’t actually go and learn it properly. But if you go and learn how to podcast and what technology is involve, what systems, what’s the best work flow and all that kind of stuff, you’ll save yourself of a lot of heartache and you’ll end up a better quality product just a result. When you got multiple podcast episodes on the go, you can get confused just the way you’re up with different things and all that. So you do need to have a really great system in there to make sure you don’t skip something, something gets lost and time on get blown up or whatever. It’s becoming an increasingly podcasting market, you begin to create the time and effort in creating a podcast. It’s going to be something that people will come back to for a second or third, fourth or fifth to listen or 24th. Loren: There’s something just little things that we’re doing that we noticed that other people aren’t doing like were doing videos for each of our podcast, little intro videos that we’re sharing on Facebook, sharing on the news feed, were sharing on the Instagram. Just doing using cross channel social media to a bit differently to how other people are doing it. A little bit of cut through. And we found that that’s helping us as well. Fiona: What I’ve learned Kay Goals about four years ago was to present a pro-blogger and she’s been invited to present pro blogger this year on August in Gold Coast. But the only reason she’s presenting, is because of the podcast because she’s presenting on the podcast. So in terms of the opportunity of the avenues and the doors of this podcast has opened up, it’s like heaven. The most important thing is to have something to be talking something that people are going to be passionately interested in. When I first had the idea of starting a podcast, I could have decided to do the impactivat8 podcast. Now I could have talked about impactivat8 and social media but I didn’t. Instead I chose something that my ideal customers would be able to associate themselves and get interested in and get passionate about and want to listen to on a regular basis. And I think that made a difference that we actually didn’t necessarily name it our business name because it sound so promotional, instead we made it about the listeners. 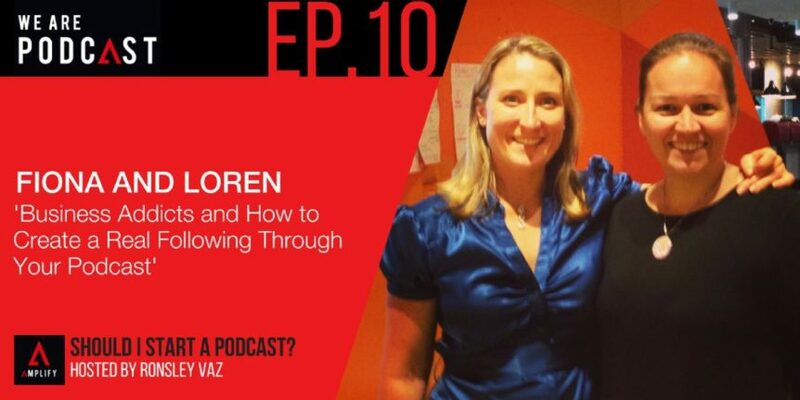 Fiona: Loren is our business podcast addict. Loren. : Yeah I am. I listen to mostly Social Media. I listen to Social Media Examiner, John Loma, and I’ve just start listening to Darren Rowse. I listen to Business, Blokes and Beers. They actually one of the kind of inspired me to want to do this as well because there’s a lot of blokes sitting around with their beers and they’re talking business and also like “well this is right in everything but still there are around of blokes.” And Wall Street, I love the podcast. I could relate it be that much being the girl.